Acer introduced its first laptop with a multitouch display, which the company said is an intuitive way to make computing fun and easy. The Acer Aspire 5738PB includes a 15.6-inch screen on which two fingers can be placed to manipulate images, write notes or zoom into maps. Multitouch input brings a new dimension to laptop functionality as it offers a natural way for users to interact with PCs, Acer said in a statement. Acer joins a bunch of PC makers offering multitouch laptops, including Hewlett-Packard and Dell. Lenovo recently introduced a multitouch laptop with a four-finger input capability. Acer will start selling the laptop in the U.S. on Oct. 22, the same day Microsoft releases its next-generation Windows 7 OS. The laptop will come preloaded with Windows 7, which has native touchscreen support. The US$799 Acer Aspire 5738PB laptop comes with Intel's Core 2 Duo T6600 processor running at 2.2GHz. It also includes ATI Radeon HD4570 graphics, 4GB of memory and a 320GB hard drive. It weighs about 6.16 pounds (2.79 kilograms). The company wasn't immediately available for comment on battery life. Acer also expanded its Aspire Timeline series of laptops with new models that are powered by Intel's low-voltage dual-core processors to help extend battery life. The laptops come with screen sizes ranging from 11.6 inches to 15.6 inches and weigh between 3.5 pounds to 5.3 pounds. 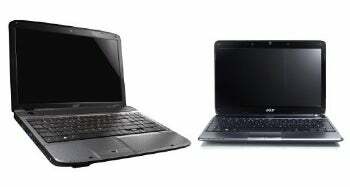 The Acer Aspire Timeline AS1810 offers an eight-hour battery life and is the thinnest and lightest of the new laptops. A sample configuration with a 1.3GHz Intel Core 2 Duo processor, 4GB of memory and 320GB of hard drive storage was listed at $599.